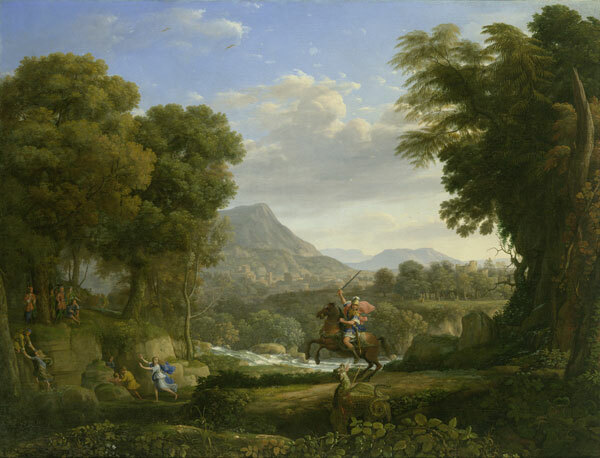 At the Taft Museum I came across a Claude Lorrain oil (on loan from the Wadsworth Athaneum) ostensibly about St. George and the dragon. But history, here, is a vehicle for landscape: the dragon ain’t no thang. Which got me to thinking about all the feedback I’m getting about how my play The Whistler could be a portal into the interesting historical moment that serves as its setting. Zora Neale Hurston noted that “There are years that ask questions and years that answer.” And that’s why I chose 1965 for my setting: it was a question year. So I’m thinking about preparing a page or two with links to the many allusions in the play, maybe some mini-articles, maybe space for users to add material too. I mean there’s the Voting Rights Act, the Andy Griffith Show, the Viet Nam “police action,” and plenty of cool material from newspapers and books I read in my background research–on jazz, on the civil rights movement, on growing up Black. I like the idea of history as an on-ramp for art, and vice versa. Me, I take my interlocutors wherever I find ’em!